Save money and eat your way to a healthy complexion. camera (Getty Images) Sunflower seeds may help improve your skin. quicklist: 1 category: Foods for Flawless Skin title: Olive Oil url: text: The main factor responsible for aging, wrinkly skin is ultraviolet radiation, or skin photoaging. A French study on 1,264 women and 1,655 men suggests that the monounsaturated fatty acid in olive oil is protective against severe photoaging. Photodamage, including blotchy pigmentation, wrinkling and skin sagging, is mainly caused by the production of reactive oxygen species (ROS) in response to sun exposure. This study suggests that olive oil in the diet increases the ability of the skin to resist damage caused by UV radiation. quicklist: 2 category: Foods for Flawless Skin title: Carrots url: text: Want to avoid premature skin aging? Load up on carotenoids, the powerful plant compounds that are responsible for the yellow, orange, and red pigments in certain plants. Some familiar carotenoids are beta-carotene found in carrots and lycopene in tomatoes. These compounds protect the skin from free-radical damage preventing cell damage, premature skin aging and even skin cancer. Other foods high in dietary carotenoids include pumpkin, tomatoes, sweet potatoes, sweet red peppers, watermelon and mustard greens. quicklist: 3 category: Foods for Flawless Skin title: Oranges url: text: A study of 4,025 women published in the American Journal of Clinical Nutrition looked at the role of diet in skin aging and found that women who have the highest dietary intakes of vitamin C tended to have fewer wrinkles. Vitamin C aids in collagen formation, which gives your skin its strength, smoothness and elasticity. Vitamin C also aids in the skin regeneration process, wound repair and has photoprotective properties. Other foods high in vitamin C are sweet red peppers, kiwi, broccoli, strawberries and cabbage. 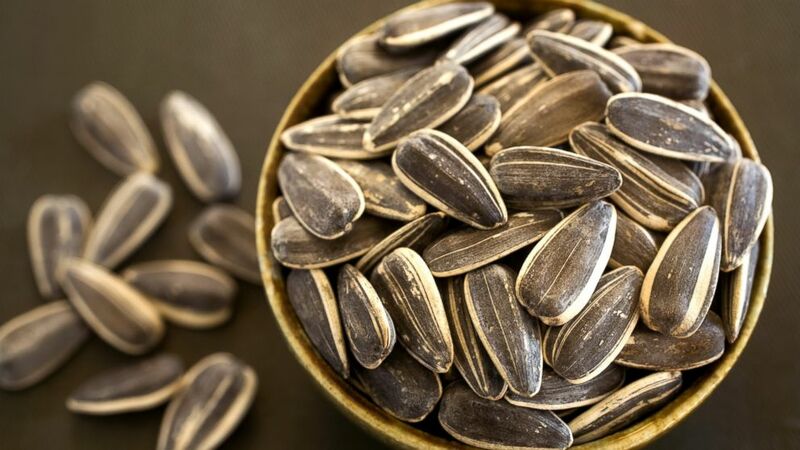 quicklist: 4 category: Foods for Flawless Skin title: Sunflower Seeds url: text: The American Journal of Clinical Nutrition study also suggests that those women who had diets high in linoleic acid had less skin dryness and skin atrophy, or thinning of the skin. Linoleic acid is an essential fatty acid, which is converted to other fatty acids such as eicosapentaenoic acid (EPA) and docosahexaenoic acid (DHA) after ingestion. EPA and DHA have photoprotective effects, which could explain the skin-protective effect of linoleic acid. Pine nuts and brazil nuts are also high in linoleic acid. quicklist: 5 category: Foods for Flawless Skin title: Wild Salmon url: text: We know that Omega-3 fatty acids are powerful supernutrients that have been shown to help with everything from depression, heart disease and cancer. Here are a few more amazing things Omega-3s do: They can decrease the inflammation that causes acne, they can help treat inflammatory skin disorders like psoriasis, and can reduce the wrinkles caused by UV-induced inflammation. Yep, they can do all of that. Dave Zinczenko, ABC News nutrition and wellness editor, is a New York Times No. 1 bestselling author. His latest book, "Eat It to Beat It!" is full of food swaps, meal plans and the latest food controversies.